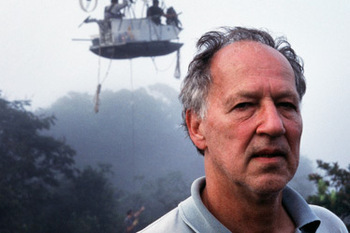 I don't so much think of Werner Herzog as a person as I think of him as a force of nature, an unlikely phenomenon, like those little balls of blue lightning that sometimes roll through swamp on a fog-thickened night. 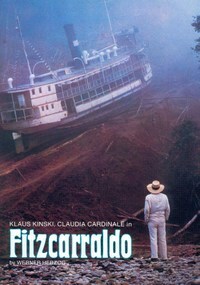 This filmmaker who, in telling the tale of a madman who carried his cargo from one Amazonian river to another by pushing a steamship over a mountain, decided to film the event by literally pushing a steamship over a mountain, has become a kind of mythic Flying Dutchman himself. When actor Joaquin Phoenix flipped his car on a Laurel Canyon road, he heard a knocking on his window and a German voice telling him to relax. 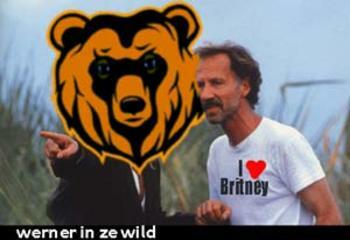 "That's Werner Herzog!" thought Phoenix. He got out of his car, said "thank you," and Herzog was gone. 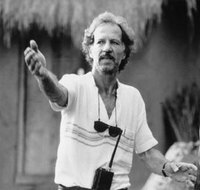 In a recent New Yorker profile Herzog was characterized by his disgruntled on-jungle-location crew as a man who despite having made over 50 movies, didn't seem to know basic things about making a movie, thus provoking disaster at every turn by doing things determinedly "wrong." 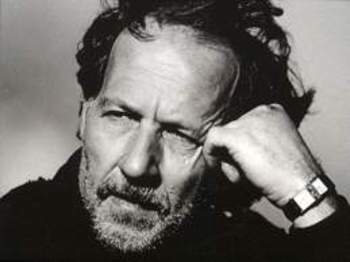 Perhaps Herzog, ever the self-educating man at 63, keeps his art alive and alert by using the indispensable tool of imagination. It was certainly at work in this larger-than-life auteur's brief encounter with Periphery Man. I was working for a publicist -- which means it must have been a time of extreme poverty, some period where my time was truly worthless; why else would I have been willing to sit in the closet-sized back room of an office for an entire day folding a press-release page into hundreds of envelopes? Granted, there was a time, long ago (i.e. before 1993), when this holiday lacked the romantic associations since bestowed on it, due to the efforts of Danny Rubin, Harold Ramis and Bill Murray. But ever since the writer, director and star, respectively of Groundhog Day created what's now generally acknowledged as one of the great American movies of all time, February 2nd has become synonymous with romance and comedy. In fact, when people ask me to name a couple of my favorite romantic comedies, this one invariably comes to mind. It's that time of the year again. 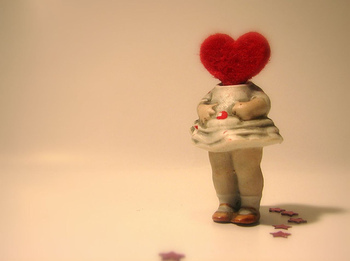 Romantic comedy lovers, lovers comedic or serious -- all humans with beating hearts know that as soon as February rolls around, there's a major holiday to be reckoned with, one that's come to symbolize the meaning of love and romance for America, if not the world. 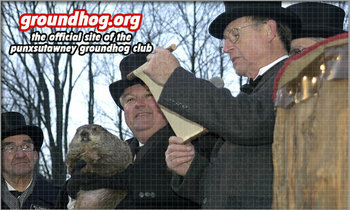 If you're a major Groundhog Day fan, you might even consider journeying to the scene of the crime: the town of Punxsutawney, Pennsylvania is having its annual celebration, and it promises to be quite a hoot. Such a trip was actually enjoyed by Day's writer and star before the movie was made, and therein lies a tale that speaks, I believe, to the true spirit of romance, or as we might say, what love's got to do with it.